Monitors the programs installed on your computer to identify malicious activity. Makes penetration of virus threats via removable drives impossible. Analyzes the software code for its match against viruses. Sets the rules of incoming and outgoing connections for programs installed on your PC. Blocks websites designed to steal personal user data. Blocks penetration of spam messages on the user's PC. Save the password from being stolen by hackers. Allows to identify junk system files and to free more disk space. Provides the removal of the information without possibility of restoration. Provides parents an effective tool for monitoring of child's activity on the PC. 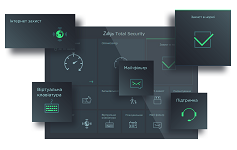 It acts as built-in controller of applications and processes, allowing you to control and manage running applications and processes. А program that allows you to analyze the applications that are uploaded at startup and to optimize boot time by disabling applications and some system functions that are not used. Privacy protection program is a program that allows to remove traces of the user's work on PC. This is the program that scans your computer for viruses. It does not require installation on your computer: just download and run it. The convenient solution for restoration of Windows normal operation after damaging by viruses. We recommend this product for those who have damaged operating system on computer or which does not boot.